Thanksgiving is not a time for easy shortcuts. Let me repeat that. Thanksgiving is NOT a time for easy shortcuts. What do I mean? Well I believe Thanksgiving should be about homemade from scratch food that you lovely share with your friends and family. It’s the time where you take the extra effort to make a pie crust, not buy a store bought one. It’s the time where you cook fresh veggies and not frozen. It’s not taking those kinds of shortcuts. Yet, time is a factor on Thanksgiving day, just as it oven space. So I am not opposed to well though, calculated shortcuts. For example, cooking the turkey in an Instant Pot. 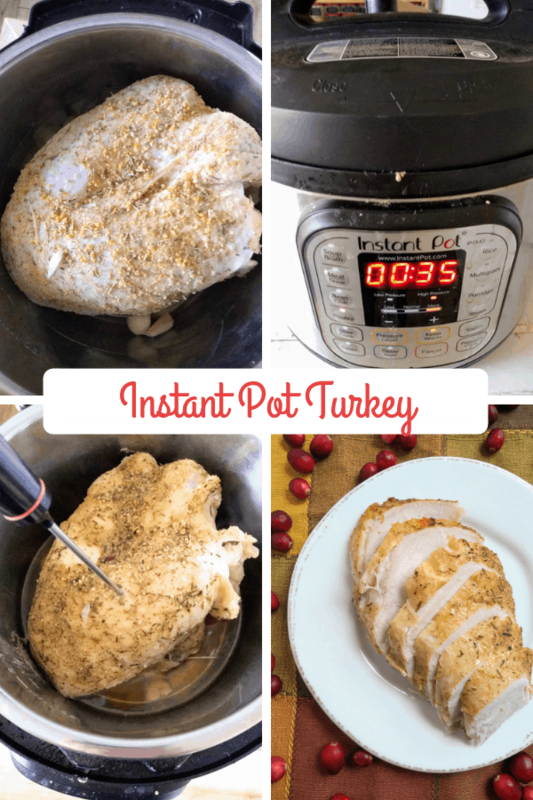 The Instant Pot is known for being a time saver, you’ll need that time on Thanksgiving day, trust me. I don’t want you to do is just to save the time at the expense of the star of the meal. That is why I am writing this post today. 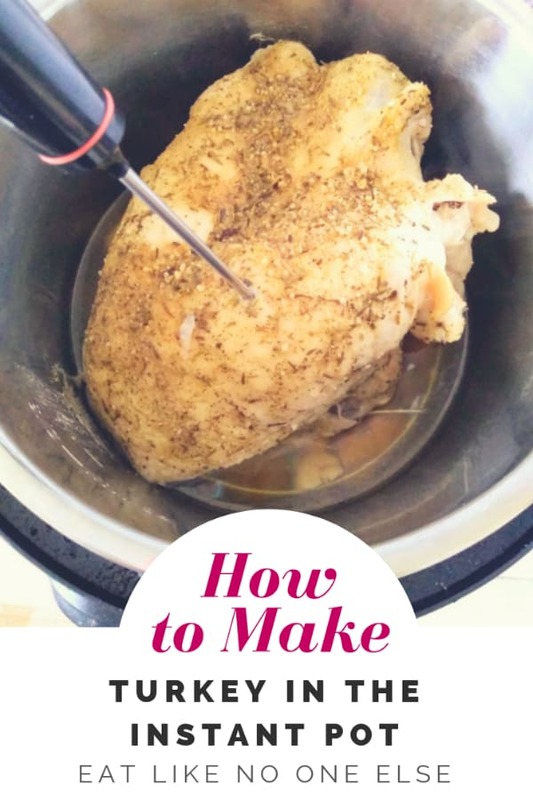 To teach you first, that you can cook a turkey in an Instant Pot, but more importantly how to do it well. Can You Cook a Whole Turkey? The smallest turkey I can think of will not fit into the largest Instant Pot I can think of. Even if I butterfly or spatchcock the turkey I don’t think I can squeeze into an Instant Pot. For sure not mine. However, a turkey breast is another story. It can fit into an Instant Pot. I am confident of this as I had already cooked a ham that was the similar size to a turkey breast in my 6qt Instant Pot. 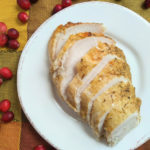 I am looking to create a flavorful turkey breast in the Instant Pot. I don’t want a lot of liquid, it’s not about boiling the turkey. I need to apply flavor to the meat directly. What I recommend is a dry brine. This is the idea of brining without the liquid. I know that sounds like the opposite. What you do is take all of the seasonings you would use for a brine minus the liquid and rub them all over the turkey. This is more than just a dry rub that put on right before cooking. No, no, no. You want to give the seasoning time to season the turkey. What you do is allow for the turkey breast to sit in the fridge, uncovered for at least 24 hours, more if you can. I have been practicing this for years with a whole turkey. I make Alton Brown’s Dried Brined Butterflied Turkey every Thanksgiving. This is the seasoning I used for my dry brine. 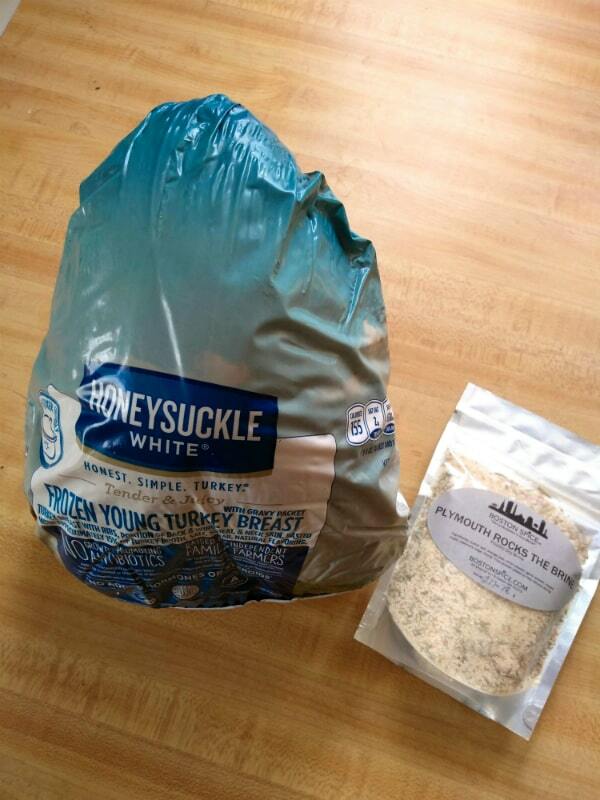 It’s from the Boston Spice Company and it’s cleverly called Plymouth Rocks the Brine. I have to stop and rave for a moment about the dry brine seasoning I used this year from the Boston Spice Company. Most of the time I am all about creating my own seasoning mixes. The people at Boston Spice were kind of enough to send me a sample of their new dry brine mix – Plymouth Rocks the Brine. It’s a flavorful mix indeed that includes kosher salt, orange peel, onion powder, garlic powder, maple sugar, rosemary, sage, thyme, all natural rice powder. I was very pleased with the results as were my wife and oldest daughter – she couldn’t stop talking about it. And the gravy I made from the drippings, was the best. 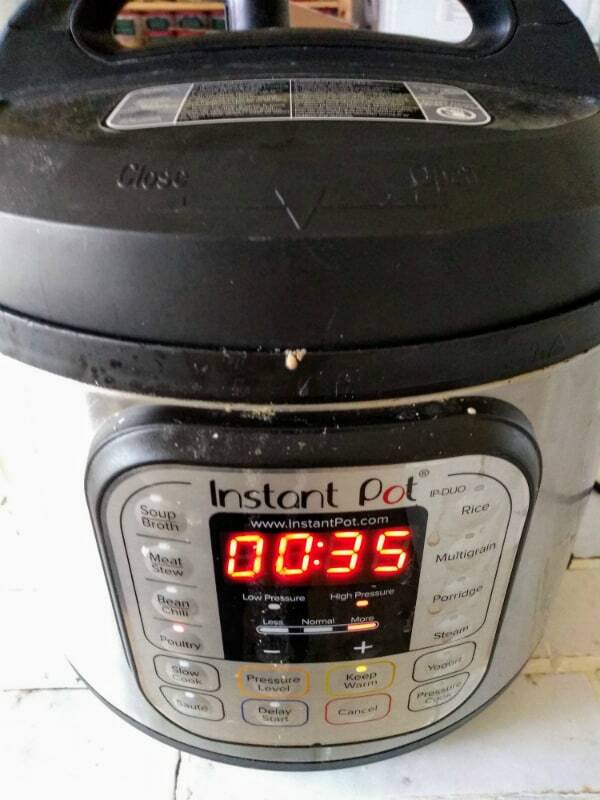 I set my Instant Pot for 35 minutes of high pressure. Don’t forget to set to seal. Once your turkey has spend it’s time hanging out with the dry brine. It’s cooking time. I start by placing onions and garlic in the bottom of the Instant Pot. I put the trivet on top off them, then add just 1 cup of turkey stock. You don’t need anymore than that, we aren’t trying to boil our turkey. Turkey goes in and Instant Pot gets set to 35 minutes. Seal her up and let it go. My turkey breast weighed around 7 pounds. You may need to adjust for a larger or smaller one. I honestly think I could have gotten away with doing mine for a little less but I feel safe that 35 minutes will get you to a safe temperature. The turkey breast needs to be cooked until the internal temperature registers at least 165 degrees. I allowed the Instant Pot to natural release, which didn’t take too long since I didn’t have a ton of liquid to start with. I think it was about 15-18 minutes. 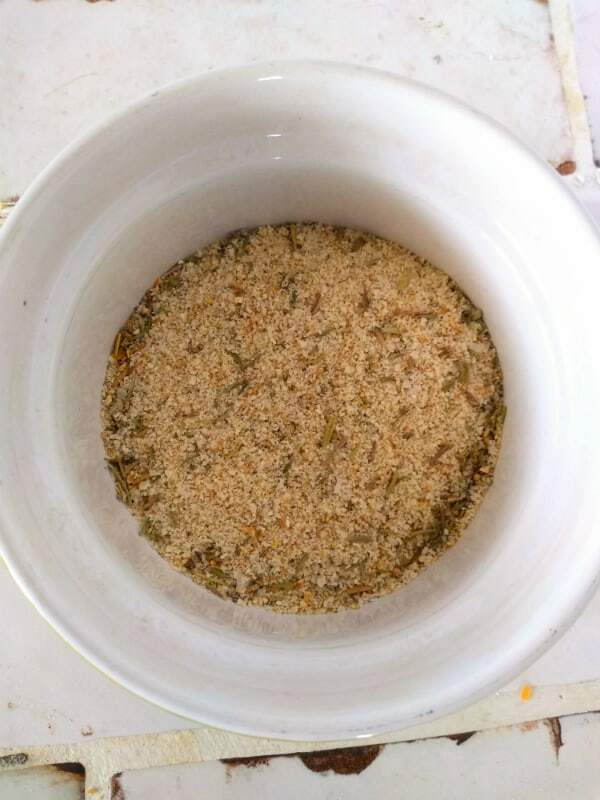 The Before – when I opened up the Instant Pot after cooking. So here is the biggest issue with cooking the turkey breast in the Instant Pot – it’s not brown. How can you serve up a turkey on Thanksgiving that is not golden brown? Your guests may rebel against you. Don’t worry. You can easily prevent a rebellion, uprising, or mutiny with your trusty oven. It’s time to broil. All you need to do is turn your broiler on, make sure the turkey isn’t touching the element and allow it to brown. Don’t leave the area unless you want blankened turkey. It will only take a few minutes. 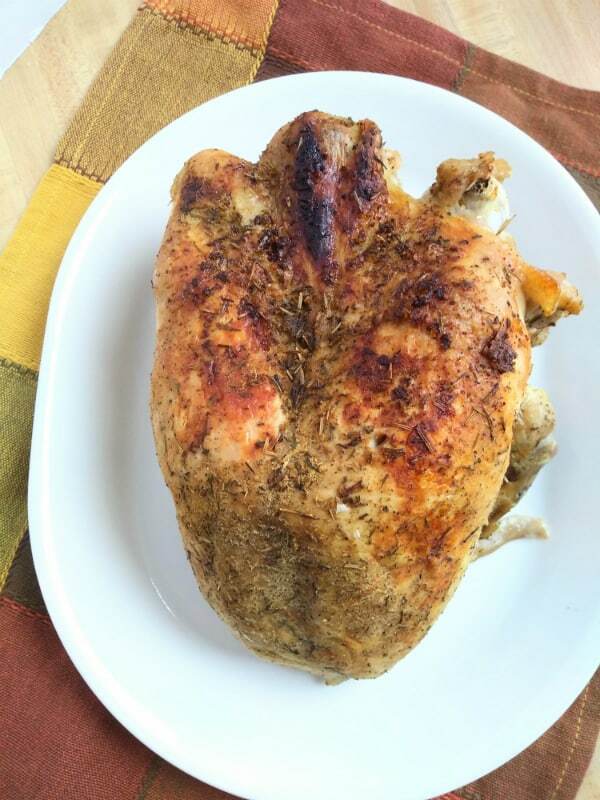 The After – What the turkey looks like after I gave it a tan via my oven’s broiler. This method works. The dry brine is the key, so don’t skip it. When sliced on an angle so that you got skin in every bite it was super flavorful even after just 24 hours with it’s dry brine. If you go longer, the flavor will further penetrate the meat. I have made turkeys that were more moist and juicy, but it was by no means dry at all. The gravy that I made from the liquid in the bottom of the pan was oh so amazing. Even if your turkey breast comes out a little drier than you were hoping for, this gravy will make up for it, in a flash. I made the gravy by making a simple roux of flour, butter, and the liquid. You also could thicken using a slurry of well mixed flour or corn starch and water. You ready for the recipe? Learn how to make a turkey in the Instant Pot. Remove the turkey from the packaging. Place on on a baking dish. Rub the seasoning mixture all over the turkey breast. Place into your fridge, uncovered for at least 24 hours. 48 would be even better. Add the onion, garlic, and 1 cup of turkey stock to your Instant Pot. Place the trivet into the pot. 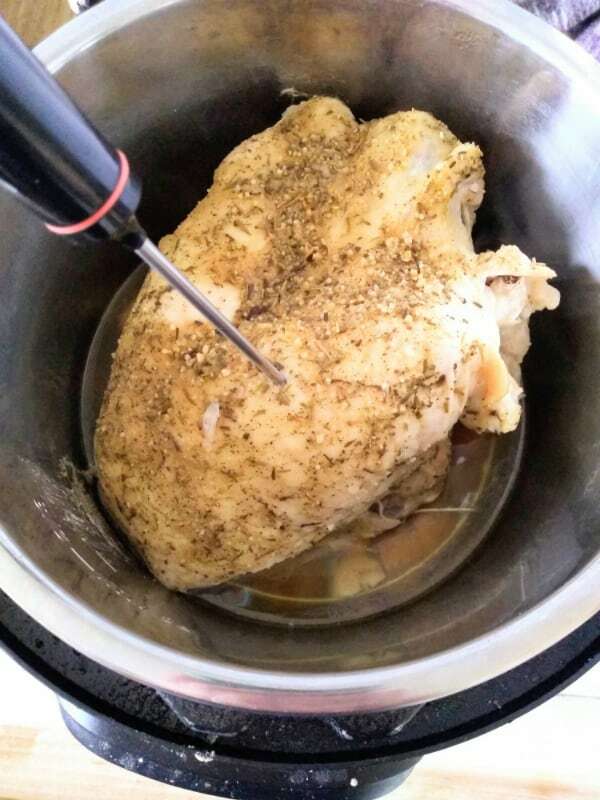 Remove the turkey breast from the fridge and place it into the Instant Pot. Set to high pressure for 35 minutes. Set to sealing. Remove the turkey from the Instant Pot and place it onto a sheet pan. Turn on the broiler of your oven. Place the turkey inside so that it doesn't touch the heating element. Cook until the skin is brown and crispy, rotating the pan if necessary. Don't not leave the area while doing this. Allow 20 minutes for the turkey breast to rest before carving. Hi, how much brine mix will I need. Thank. You. Somewhere between 1/4-1/2 cup would be good. I like to have plenty to make sure I got every bite of that turkey surface covered.